Do not use if you are pregnant or breastfeeding. If you are using statins (HMG-CoA reductase inhibitors), consult with your doctor first. Flax seed oil (Linum usitatissimum) ALA, gelatin, glycerin, red yeast rice extract (Monascus purpureus), coenzyme Q10 (ubiquinone), purified water, iron oxide. StatiQinon consists of capsules containing a unique blend of three ingredients which are an extract from Red yeast rice, coenzyme Q10 and alpha-linolenic acid (ALA) extracted from flaxseed oil which helps to maintain healthy blood cholesterol levels while at the same time it is also well tolerated. Red yeast rice is a product made of the yeast Monascus purpureus which have been cultured on rice. This process produces a strong red colour. Red yeast rice contains 14 active compounds called monacolins. One of the monacolins (monacolin K) is able to effectively block the enzyme HMG-CoA reductase which is a step in the process leading to the production of both cholesterol and coenzyme Q10 in the body. Red yeast rice also contains unsaturated fatty acids and phytosterols. ALA is short for ”alpha-linolenic acid”, a type of omega-3 fatty acid that is found in plants. ALA is an essential fatty acid meaning that it can't be produced by the body but must be obtained through the diet. Sources for ALA include canola, soy, and walnuts. ALA is effective for maintaining normal cholesterol levels. Dietary ALA decreases circulating cholesterol, and increases cholesterol efflux in foam cells. ALA prevents cholesterol to be integrated in plaque /athero-sclerosis through the foam cells and into the arterial wall. Coenzyme Q10 is a vitamin-like compound which practically all cells in the human body depend on in order to produce energy. The energy is made from a biochemical conversion of fat, carbohydrate, and protein into ATP (adenosine triphosphate), a molecule that stores energy. Coenzyme Q10 is a downstream product of the mevalonate pathway, just like cholesterol. 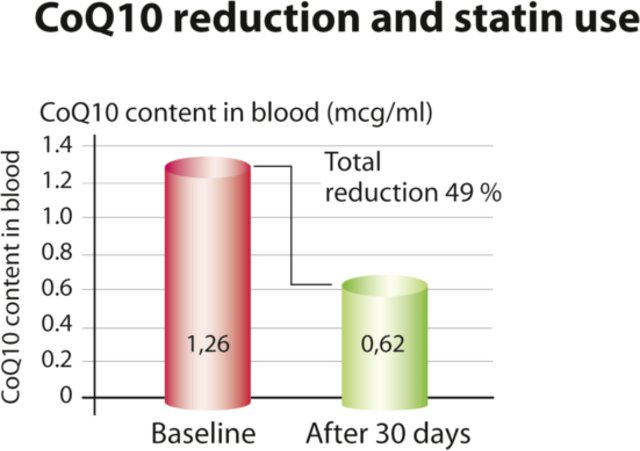 Since coenzyme Q10 and cholesterol are both synthesized from the same substance, mevalo-nate, this implies that if the body's production of cholesterol is reduced by a statin, the body's production of coenzyme Q10 is reduced accordingly. Statins are a class of cholesterol-lowering drugs that work by inhibiting the enzyme HMG-CoA reductase, which is plays a central role in the liver’s synthesis of cholesterol. 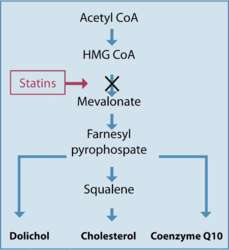 There are many different types of statins, some with a more potent LDL-lowering effect than others. Linfröolja (ALA), Kapselhölje: gelatin, Fuktighetsbevarande medel: glycerol, fermenterat rödrispulver (innehåller jäst), Coenzym Q10, Fuktighetsbevarande medel: renat vatten, Färgämne: järnoxid.